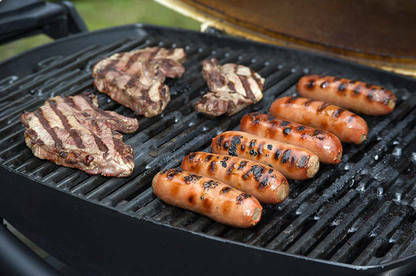 What makes a good barbecue? Since we first got our hands on them 4 years ago Weber’s barbies have consistently dominated our annual test, to the point where they now occupy the top 7 spots in our roundup. But why do some barbecues keep cleaning up while others crash and burn? We delve into the guts of a top performer and a lower-scoring barbie to sort the sizzle from the steak. 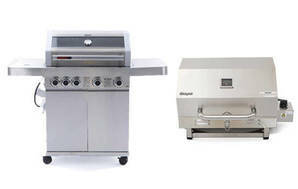 The 2 models we’re comparing are the Weber Q Premium (Q2200AU), which scored 85% overall and either 9s or 10s across our grilling tests, and the Jumbuck 4 Burner Hooded Portland BBQ, which only managed 3 and 5 in the same 2 grilling assessments – see how we test for more information. 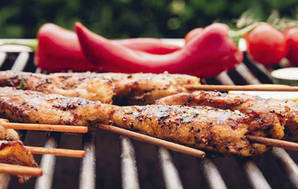 The Q Premium is Weber’s biggest seller. It’s a crossover between portable and fixed patio/deck barbecues, with a larger cooking area (0.21m²) than most portables but light and compact enough that you can throw it in the boot for a weekend away. It’ll set you back $599 plus another $169 for the folding stand (pictured) and $80 if you want a half-hotplate to grill diced veges. That’s $848 for everything we needed for our tests apart from the gas cylinder, which is pretty pricey for a trumped-up portable barbie. In contrast, the Jumbuck ($178) is designed to remain in your backyard, but boasts a more generous cooking area (0.34m²) than the Weber, and 4 separately controlled burners, while the Weber features a single large burner. Our performance assessment focuses on evenness and consistency. The Weber cooked each sausage and steak at the same rate no matter where they lay on the cooking surface, with consistent grill lines and very little charring, resulting in evenly cooked tender meat throughout. Steak and sausages cooked on the Weber Q Premium. Steak and sausages cooked on the Jumbuck Portland. The Jumbuck was a different story. Its cooking surfaces heat very unevenly, with hot and cold spots (familiar to anyone who’s run a sausage sizzle on an old barbie). The Jumbuck burnt 1 sausage to a crisp while the rest were left undercooked. It also lacked the power to sear chargrill lines into the steaks, resulting in unevenly cooked, greasy meat. Even when we rotated food around the grill, it was near impossible to cook anything at the same rate on the Jumbuck. That said, the Jumbuck’s hotplate heated a lot more evenly than the serrated grill surface, as shown by the 7/10 it earned in the chicken wing cooking test conducted on the hotplate, while it’s surprisingly good at roasting a whole chicken with the hood down. Fewer burners: the Q Premium features a single burner; a stainless steel tube with small perforations that snakes its way around the barbecue’s body beneath the grill. 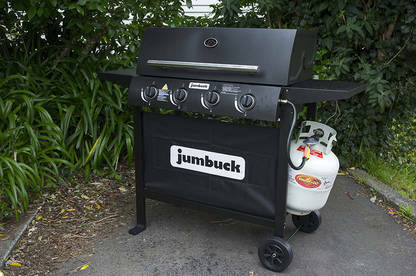 The Jumbuck has 4 separate burners that run parallel to each other beneath the cooking surfaces. 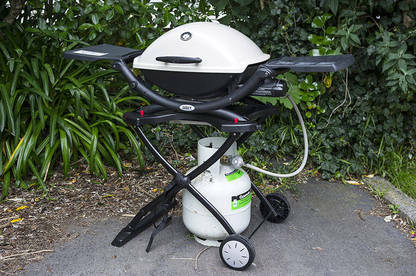 Generally, Weber barbecues feature fewer burners than models of the same type from other brands, for example its Genesis and Spirit ranges use 3 burners where other manufactures would employ upwards of 4. Fewer burners are a trade-off between being able to cook a variety of foods at different rates and the heat being evenly distributed. For the extra quality and evenness of cooking, we think cutting back on the burners is a sacrifice worth making. Hood down: on a Weber you cook everything with the hood down. The hood has a steep dome shape and forms a cocoon with the barbecue’s body around the grill. This forces heat to recirculate quickly, which helps keep temperature consistent. No flame tamers: the Jumbuck has inverted V-shaped strips of metal that sit above the 2 burners and beneath the serrated grill surface. These “flame tamers” direct fat drips away from the burners, reducing flare-ups. However, they also diminish the power of the burners, meaning slower cooking and uneven grilling. In contrast, the Weber has no need for flame tamers as it integrates drip protection into the grill itself. 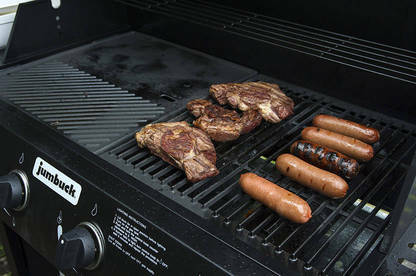 The serrated grill is solid above the burner, which angles drips away from the flames to prevent flare-ups, while still allowing most of the heat to reach the food. The Weber is constructed from materials that can handle the tough life of an outdoor appliance. The Q features porcelain-enamelled cast-iron cooking surfaces, protecting them against corrosion, along with a cast-aluminium body and hood. Aluminium is lightweight and won’t rust, but can develop oxidation (“white rust”) unless kept clean. While unsightly, this won’t cause structural damage. But it’s not perfect: the major drawback being the flimsy side-tables, which can’t support heavy items such as a porcelain baking dish. The Jumbuck’s body, hood and trolley, like many cheaper barbecues, are made from thin powder-coated low-grade steel, which will rust wherever the powder scratches off. We assembled the Jumbuck on grass and tried not to nick the powder, but it suffered a couple of fairly serious gouges as it’s a bit fiddly getting some parts into place. Unless permanently covered, it’s likely to show signs of corrosion before the end of summer. Its grill and hotplate are uncoated cast-iron, another material prone to corrosion. However, its burners are constructed from high-quality 304-grade stainless steel, meaning they’re unlikely to rust out. Our barbecue testing shows it doesn’t pay to go cheap if you want good performance and a long-lived barbecue. While they come with a sizeable price tag, especially once the extras are added, Weber remains the last word when it comes to getting great results with minimal effort. However, Weber’s barbecue sauce is no great secret. There’s no reason an enterprising manufacturer couldn’t build on the lessons from the success of Weber grills, while adding innovations of its own. Here’s hoping next season we’ll see some models that challenge Weber’s supremacy, ideally at a price accessible to a wider range of Kiwis. The S/S-4 ($999): A very good performer at a highly competitive price for a large all-stainless 4-burner that’s let down by some ease of use issues. Also has a larger cooking area than the Weber Family Q at the same price. Worth considering as a striking addition to your backyard if you can live with a few control and assembly niggles. The Westhaven High Hood ($349): A good all-round small portable barbecue that unfortunately suffers from several ease-of-use niggles, notably it doesn’t have side panels to protect the flame from drafts and the stainless steel interior and exterior takes extra effort to clean after you've finished cooking. However, its low price makes it worth considering if you’re on a budget but want something more than your old camp stove this summer. From large patio-style models to smaller portable models, our latest test includes a barbecue to suit most people.